I’m on a carb kick. No, seriously. I’ve literally had pasta or gnocchi every day this week. Do I feel guilty? Nope, not one bit! And neither should you! I was raised in a pasta-focused household so I was never indoctrinated with this American mentality of “low-carb” this and “low-calorie” that. I was raised with lots of carbs, yes, but I was also raised with an abundance of fruits, vegetables, and salads. For the most part, each meal was served with a big salad (dressed with evoo and balsamic) and a veggie in addition to the main course. To this day, I still eat that way. Each day for lunch I have a big salad chock-full of beans, various lettuces, broccoli, cabbage, cucumbers, tomatoes, and whatever else I have in my fridge at that time. That way, for dinner I can eat gnocchi with cream and not feel a bit guilty about it. I recently started exercising again, so maybe that has something to do with my carb overload. “Hey, I’m working out so I can eat whatever I want, right?” This is such typical girl reasoning. In any case, you should make this dish whether you’re working out or not and whether you’re watching your carb intake or not because you would be depriving yourself of an excellent gustatory experience if you didn’t. I promise it’s worth the calories. 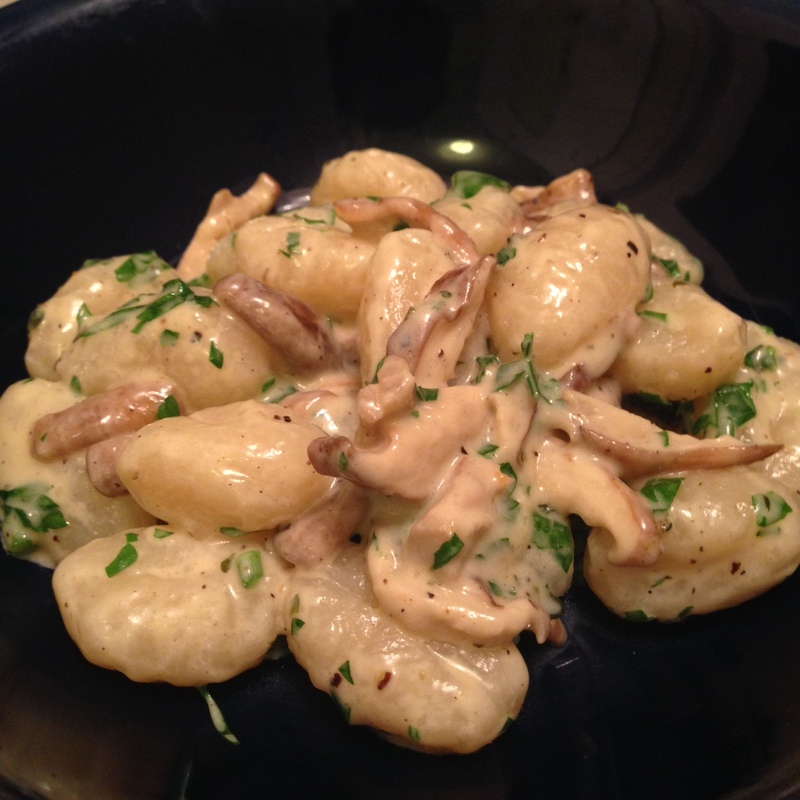 The soft gnocchi are coated with a velvety cream sauce that is infused with a strong mushroom flavor and just a hint of thyme. It’s so good that I made it twice for dinner this week. Don’t judge. 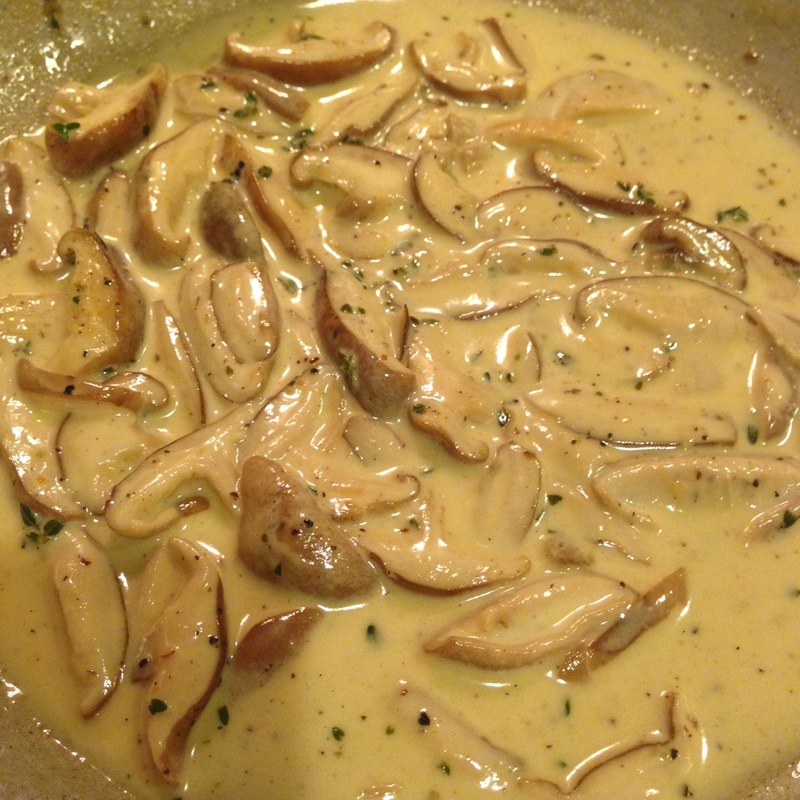 In a medium pan, melt your butter over medium heat and add the sliced mushrooms. Let them cook for about 5 minutes and then add the thyme. Add your wine and let simmer until it evaporates a bit (about 2 minutes or so). Add your cream, season with salt and pepper, and let simmer over medium heat about 5 minutes or until it’s the correct consistency that you like. It should not be soupy! Once your sauce is almost done, cook your gnocchi. They should only take about 3 minutes to cook. Once they start floating to the surface, they’re done! 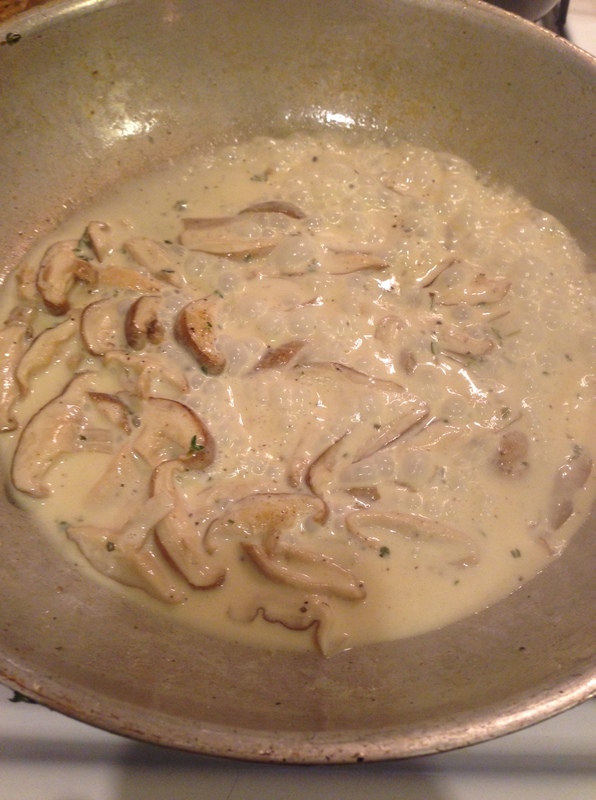 Drain, combine with the sauce, and toss in your parsley. You can serve with parmesan cheese, but I think it’s delicious without it! ← Three pasta dishes that take 20 minutes or less! Love this recipe! Thank you, I am also a teacher and love your blog. 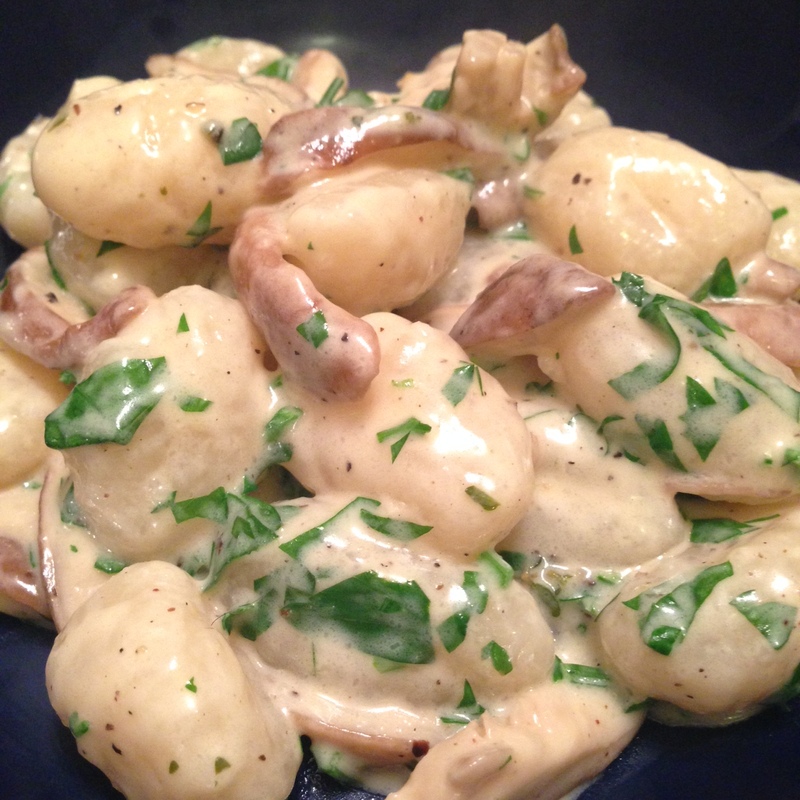 My husband is now OBSESSED with gnocchi and is asking for more recipes…anything you can give is appreciated! Thank you! I love gnocchi also 🙂 I also like to prepare them with a brown butter and sage sauce, pesto sauce, cream, peas, prosciutto sauce, and also just a simple tomato sauce. Enjoy! Let me know if there is anything you’d like to see on the blog. Thanks for stopping by!